no visible fixings, large footrest. Available in a large choice of colours and choice of Hydraulic bases. Dimensions height 810mm, width 580mm, depth 830mm, initial seat height 470mm. 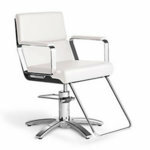 Takara Belmont Ai Styling Chair, stylish fully upholstered hydraulic chair with 360º lockable rotation, low backrest, available with duotone upholstery, large footrest. Dimensions height 785mm, width 660mm, depth 665mm, initial seat height 450mm. 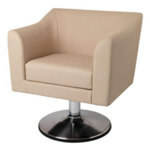 Dimensions height 88cm, width 67cm, depth 94cm, initial seat height 52.5cm. Available from stock(please ring 01270 630280 for details). 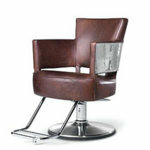 The Dandy is a multi-funtion styling and backwash chair with a stylish, innovative and contemporary design. This strong and sturdy chair incorporates a reclining backrest, soft upholstered arm pads and an adjustable integral headrest. 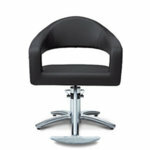 With a chrome hydraulic base, footrest and a padded sprung seat offering maximum comfort and support. It is perfect for either barbering, hair or beauty services and can be paired with any shampoo basin. 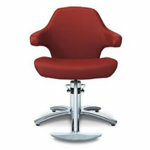 Available in a full range of colours and bases, please ring the office on 01270630280 for details. Dimensions: Height 1075mm, Width 755mm, Depth 1200mm, Fully Reclined Depth 1570mm, minimum seat height 540mm. 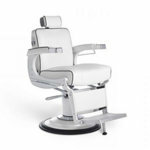 Takara Belmont Cadilla Styling Chair, stylish styling chair with a stylish, innovative and contemporary design, a strong and sturdy chair incorporating chrome arms and a choice of hydraulic bases, footrest with stopper and a large padded sprung seat offering maximum comfort and support for your customers. 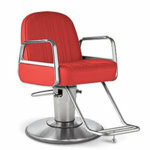 It is perfect for either barbering, hair or beauty services. 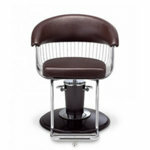 Takara Belmont Cadilla 50s Styling Chair, stylish styling chair with a stylish 50's look with a innovative and contemporary design, a strong and sturdy chair incorporating chrome arms and a choice of hydraulic bases, footrest and a padded sprung seat offering maximum comfort and support for your customers. Made to order from Japan(please ring 01270 630280 for details). Takara Belmont Sofa A Hydraulic Styling Chair, a Takara Belmont hydraulic chair with high quality stitching and soft padded upholstery to provide ultimate comfort. The Styling sofa's design incorporates a low level backrest enabling easy access to the client. The Sofa A chair is usually in stock in the colour black and is available for delivery in 5-7days. It is also available in a full range of other colours for delivery in 3-4 weeks, please ring the office on 01270630280 for details. Dimensions: Height 787mm, Width 725mm, Depth 595mm. 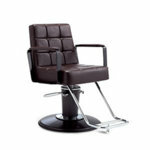 Takara Belmont Sofa B Hydraulic Styling Chair, This Takara Belmont hydraulic chair with high quality stitching and soft padded upholstery to provide ultimate comfort. The Styling sofa's design incorporates a low level backrest enabling easy access to the client. The Sofa B chair is in stock in black for delivery in 5-7days it is also available in a full range of other colours for delivery in 3-4 weeks, please ring the office on 01270630280 for details. Dimensions: Height 845mm, Width 710mm, Depth 625mm. 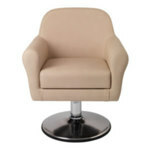 Takara Belmont Chocco Styling Chair, stylish upholstered hydraulic chair with 360º lockable rotation, large footrest with stopper, detail stitching. Also choice of arm finishes chrome, matt Brown or metalic brown metalwork. Dimensions height 860mm, width 590mm, depth 970mm, initial seat height 520mm. Belmont branded footrest with stopper, 360º lockable pump hydraulic matt silver base, chrome foot rest. Dimensions height 88cm, width 62cm, depth 93cm, initial seat height 52cm. 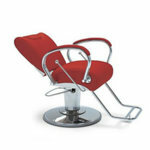 low backed stylish upholstered salon chair with chrome metalwork hydraulic base with 360º lockable rotation, large footrest with stopper and available in a large choice of colours and choice of Hydraulic bases. Dimensions height 810mm, width 655mm, depth 975mm, initial seat height 505mm. 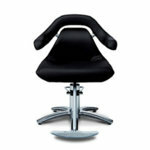 Takara Belmont Ma Styling Chair, with futuristic lines, the Ma echo your client’s form, supporting and hugging. 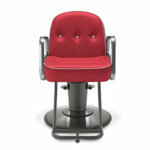 Salon designers will love the quirkiness of the Ma’s silhouette and the punch of its profile. 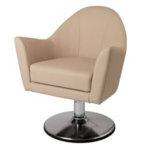 Ma suits a round or 5-leg base and two-tone upholstery is an attractive design option. Available in a choice of hydraulic bases and choice of colours(please ring 012790 630280 for more details. The rich and diverse culture and nature of Japan has influenced designers in creating the series of three: subtle elements of Japan’s distinctive landscape, unique traditions and arts pervade the detail of the chairs. Dimensions height 800mm, width 645mm, depth 655mm, initial seat height 460mm. Takara Belmont Ori Styling Chair, stylish fully upholstered hydraulic chair with 360º lockable rotation, low backrest, available with duotone upholstery, large footrest. 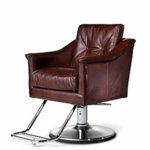 Takara Belmont Sofa C Hydraulic Styling Chair, the Takara Belmont Sofa C hydraulic chair with high quality stitching and soft padded upholstery to provide ultimate comfort. The Styling sofa's design incorporates a low level backrest enabling easy access to the client. The Sofa C chair is usually in stock in black for delivery in 5-7days and is also available in a full range of other colours for delivery in 3-4 weeks, please ring the office on 01270630280 for details. Dimensions: Height 850mm, Width 695mm, Depth 610mm. 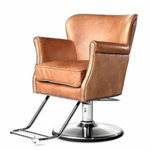 Takara Belmont Spitfire Hydraulic Styling Chair, stylish chair in brown leather upholstery with metal detail, 360º lockable pump hydraulic matt silver base, chrome foot rest. Dimensions height 88cm, width 63.5cm, depth 91cm, initial seat height 52cm.